*** All dates and schedules subject to change based on several variables, including planning, design, permitting, available funding, etc. 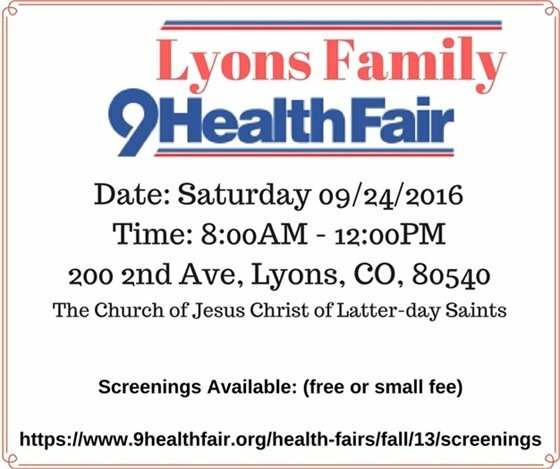 For questions, please contact the Lyons Department of Parks and Recreation at 303-823-8250 or email recreation@townoflyons.com. McConnell Bridge has been designed up to 30% and is waiting for FEMA to approve the bridge and road design. Upon FEMA's approval, the final design – which includes McConnell Drive pavement – will be completed, and construction will be scheduled. FEMA has been made aware that this project is Town’s first priority. Updates will be sent following FEMA’s response. 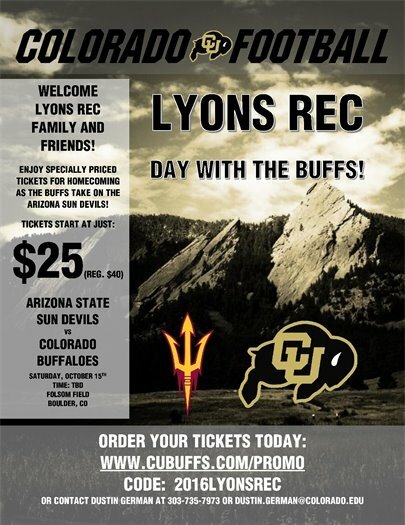 Lyons Parks and Recreation has teamed up with Colorado University Football for discounted tickets, to benefit the Lyons Parks recovery efforts! Discounted tickets are available for Homecoming Weekend's Arizona State Sun Devils game on Saturday, October 15, and the UCLA Bruins game on Thursday, November 3. 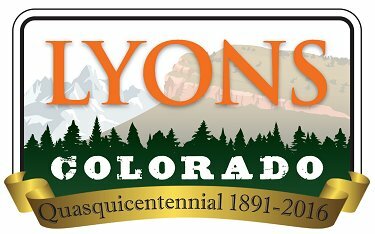 Five dollars of each ticket sold will be donated to the Lyons Parks and Recreation department, to aid in rebuilding parks and recreation fields. The contractor has completed all the roadway curb and gutter in the project's vicinity. Preparation for paving is underway; pavement installation is anticipated to begin around September 29, weather permitting. Please note that throughout the paving phase, traffic accessibility will be restricted. Residents are asked to keep vehicles off the roads from 7 a.m. to 7 p.m. Contractors have completed the installation of raised islands at crosswalk locations along US-36, and landscaping along the north side is nearing completion. Over the next few weeks, the contractors will be preparing for curb and gutter installation on Railroad Ave.
Lane closures and other traffic delays can be expected throughout the project on weekdays, from 7 a.m. to 7 p.m. Please note the speed limit remains at 25/35 mph in the construction zone. Your cautious driving may save a life! On September 13, 2016, Sheriff Joe Pelle rescinded the fire ban in place for western Boulder County. The decreased temperatures and additional moisture we have received have decreased the wildfire danger to our community. Although our risk for wildfire has decreased, we still urge residents and visitors to make sure that any open burning is done in a safe manner. Never leave a fire unattended and ensure that the fire is completely out and cool. Remember, if it’s too hot to touch, it’s too hot to leave. Residents are also reminded that although the fire ban has been rescinded, there are still permit requirements in place for slash burning and broadcast burns, also known as prescribed fires. Permits are available online at: www.bouldercounty.org/safety/fire/pages/openburnpermit.aspx or at the Boulder County Sheriff’s Office Headquarters, located at 5600 Flatiron Parkway, Boulder. Agricultural burns and campfires are now allowed and do not require a permit. For current fire and shooting restrictions for United States Forest Service properties, which includes most campgrounds in western Boulder County, please visit their website for the most up-to-date information: http://www.fs.usda.gov/alerts/arp/alerts-notices. Registration is OPEN for this FREE event that will take you around the Saint Vrain Watershed to get a closer look at some of the flood recovery projects that have been completed or are in development. We will have speakers at each stop to give tour participants insight to what has happened and what will happen within these various project areas. Every 11 seconds an older adult is treated in the emergency room for a fall. Every 19 minutes an older adult dies from a fall. Many older adults limit physical and social activities due to fear of falling which in turn can lead to an increased risk of falling. The AAA, in conjunction with the Boulder County Partners for Falls Prevention, is offering this annual event to help educate area residents on the many ways they can reduce their risk of falling.